Since the debut of RAB eleven years ago, we’ve hosted the annual Prospect Watch in our sidebar, in which we track the progress of a specific prospect throughout the season. The Prospect Watch actually predates RAB, though that’s a conversation for another time. Point is, we pick a prospect, then track his season in the sidebar. People seem to like it, so we keep doing it. There is the little matter of the so-called Prospect Watch curse. Last year Gleyber Torres was the Prospect Watch prospect and he missed half the season with an elbow injury. The year before it was James Kaprielian, and he missed most of the season with an elbow injury. 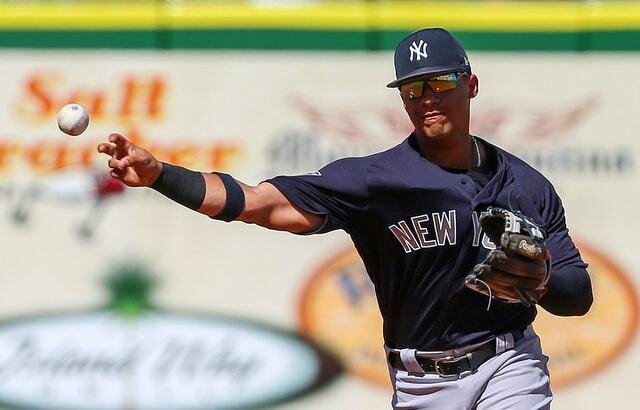 Of course, Aaron Judge and Gary Sanchez were both in the Prospect Watch at one point, and they’re super awesome. I don’t believe in curses so the Prospect Watch continues. Prospects get hurt. It happens. In the past I would make an executive decision and pick the Prospect Watch prospect myself. A few years ago I decided to open it up to a reader vote and that seems to work better, so let’s do that again. I selected six candidates for the 2018 Prospect Watch and, because the Yankees have a pitching heavy farm system, five of the six are pitchers. Here are the six candidates, listed alphabetically and with my top 30 prospects ranking. The Case For Abreu: You could argue Abreu has the best stuff in the farm system. His fastball sits an easy 93-98 mph and his slider, curveball, and changeup all show a lot of promise. Abreu threw 53.1 Single-A innings last season with a 3.37 ERA (3.12 FIP), 27.6% strikeouts, and 8.1% walks. A quick return to High-A Tampa with a midseason promotion to Double-A Trenton is in the cards. Abreu is a candidate to lead the system in strikeouts this year. The Case Against Abreu: All pitchers are an injury risk and Abreu is riskier than most. He missed lots of time last season — again, he threw only 53.1 innings last year — with elbow and lat problems. Also, Abreu had his appendix taken out early in Spring Training and he has been behind the other pitchers in camp, so there’s a chance he won’t even be ready to pitch come Opening Day. His season debut may be delayed a bit, which is no fun for Prospect Watch purposes. The Case For Florial: Florial was one of the top performers in the farm system last year, hitting .298/.372/.479 (145 wRC+) with 13 home runs and 23 stolen bases in 476 plate appearances split between Low-A Charleston and High-A Tampa. If you’ve watched him at all this spring, you know everything Florial does is electric. He has lots of power and he runs like the wind. Unfortunately, his range and arm strength won’t show up in the Prospect Watch, but Florial has that stuff too. The Case Against Florial: Simply put, Florial is a boom or bust prospect. He is loaded with tools, but he struck out in 31.1% of his plate appearances last season — his 15.5% swing-and-miss rate was 69th highest among the 743 minor leaguers with at least 400 plate appearances last year — and anytime a player has that much swing-and-miss in his game, he is at risk of prolonged slumps. Especially since he’s only 20. Florial could do something amazing or something awful this year.
? The Case Against Loaisiga: Injuries, man. Loaisiga returned from Tommy John surgery just last season and he also dealt with arm problems earlier in his career, which is why the Giants released him in the first place. He’s thrown only 103.2 total innings in parts of five minor league seasons, so, even if he stays healthy in 2018, the Yankees might have to shut him down for workload reasons at some point. Nothing worse than a Prospect Watch that goes dormant weeks before the end of the season. The Case For Perez: Thanks to a 2.84 ERA (3.59 FIP) with 22.7% strikeouts and 8.7% walks in 123.2 Low-A innings, Perez was the breakout pitcher in the farm system last year. He’s a big dude (6-foot-8) who has started to figure out how to repeat his delivery, allowing him to throw more strikes and hold his stuff deeper into games. Perez will sit mid-90s and touch 100 mph, and his hammer curveball is a legitimate put-away pitch. He also throws a slider and a changeup. Lots to like here. The Case Against Perez: I guess that, aside from the inherent injury risk, Perez could become unglued with his delivery and lose the strike zone. That tends to happen with young pitchers this tall. Just a year ago Perez ran a 10.5% walk rate with Short Season Staten Island. He could lose his mechanics and the plate. Walks are an eyesore in the Prospect Watch. The Case For Sheffield: The overall Spring Training numbers weren’t good (seven runs in 5.1 innings), but Sheffield showed the goods during Grapefruit League play this year. His fastball was anywhere from 94-97 mph and he showed a true wipeout slider. It was hard not to be impressed by the stuff. Sheffield had a 3.12 ERA (4.43 FIP) in 98 Double-A innings last season and he punched out 20.8% of batters faced. The Case Against Sheffield: Sheffield did miss time with injury last season, though it was his oblique, not his arm, so nothing worth worrying about this year. More than that, Sheffield’s control is not great (8.0% walks last year) and he is surprisingly home run prone. He served up 14 homers in those 98 innings last season, or a 1.3 HR/9. And that was in a pitcher’s park too. The stuff is as good as you’ll see. Sheffield’s results are not there just yet. The Case For Tate: Reports last year indicated Tate’s stuff is back to where it was in college, when the Rangers made him the fourth overall pick in the 2015 draft, and based on what I saw in his lone televised Grapefruit League outing a few weeks ago, Tate is indeed back on track. His fastball was consistently mid-90s and both the slider and changeup were impressive. Tate threw 83.1 innings with a 2.81 ERA (3.95 FIP) at High-A Tampa and Double-A Trenton last season. The Case Against Tate: A shoulder issue forced Tate to wait until late-June to make his season debut last year, and that’s never good. Also, Tate’s fastball is more hittable than the velocity would suggest because it is straight, hence the underwhelming 18.4% strikeout rate last season. The Yankees are working with Tate to add a two-seamer, though who knows how that’s going. Heck, the two-seamer could create a new set of problems if Tate can’t control it. The injury risk is greater than normal here and Tate’s fastball is kinda hittable, so there’s your case against. Surely you noticed many of the top prospects in the farm system are not Prospect Watch candidates this year, and I have a good reason for that. Gleyber Torres (No. 1 on the top 30), Miguel Andujar (No. 3), Tyler Wade (No. 6), Chance Adams (No. 7), and Domingo Acevedo (No. 13) all figure to see big league time this year, potentially a lot of it. We’ve had Prospect Watch players reach the big leagues before, though I prefer to focus on a minor leaguer, not someone we watch play every day. Other notable prospects like Luis Medina (No. 9) and Matt Sauer (No. 12) are likely to begin the season back in Extended Spring Training, meaning they might not appear in games until the short season leagues start up in June. Clarke Schmidt (No. 14), last year’s first rounder, is rehabbing from Tommy John surgery and isn’t expected back until midseason. Anyway, the six candidates are the six candidates, so let’s get to the poll. I’ll leave this open until Friday. Who should be the 2018 Prospect Watch?